My first game was at Jacksonville, in the height of the summer. So it was burning up, and very humid. I’m a Cali boy, so it was hot as hell for me. One of the things that really stood out to me was the pregame routine. 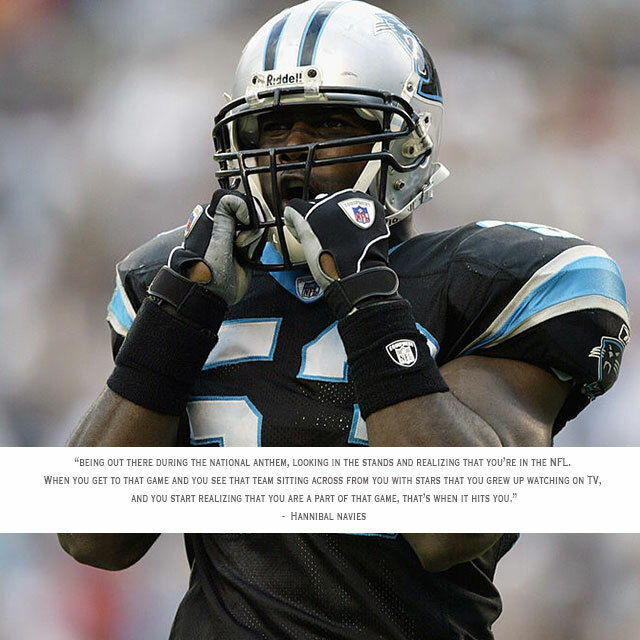 Sam Mills was my linebackers coach, and was in his first year, so I was the first linebacker he ever coached. He always used to tell me to get my routine. But from college to the NFL, it’s totally different. So I had no idea what was going on, and I was just walking around the locker room trying to follow what other people were doing. Some people were out early before the game started, but I was kind of just winging it in the locker room with all this time. In the NFL, the team takes more than one bus from the hotel, so I took the first one and am now sitting in this empty locker room with like five people and the punters, just getting nervous. I remember going out to the field for pregame, and I couldn’t breathe. It was one of those situations where, I was in shape, but I couldn’t breathe. I felt like I had played a game already. I was concerned, because I didn’t know how I was going to make it through a game when I was struggling in warmups because I was so nervous and tired. I remember going back in to the locker room, and someone convinced me to drink a couple of Red Bulls. So I drink them, and for some reason after that, it gets real foggy. When I got on the field, I couldn’t remember my plays. Watching the film after the game, that was my first time understanding what was going on because for some reason, it was like I was just out there floating in space. So I was just doing the wrong drops, filling the wrong gaps, and my coaches just chalked it up to the fact that I was a rookie and it was my first preseason game, and they just let it go and told me I needed to get my stuff together. But obviously I never took another Red Bull before a game. Sitting out there during the national anthem, looking in the stands and realizing that you’re in the NFL. That was the first time it really hit me. When you get to that NFL game and you see that team sitting across from you with stars that you grew up watching on TV, and you start realizing that you are a part of that game, that’s when it hits you. For me, it was something I’ll never forget.